There’s been a brewing controversy in the industry recently about the music release day. What, you might ask in this age of you YouTube, Spotify, Pandora, iTunes, radio, leaks, and Soundcloud, is a release day? I’m glad you asked. One day every week, new music is released to retail outlets and streaming services. But here’s where it gets tricky. It’s a different day in many countries. In the US new music day is Tuesday. But in the UK it’s Monday. Japan, Wednesday. Germany and France, Friday. Why is it different? The release day has been driven by music charts. In the US, the Billboard and Soundscan charts run from Tuesday to Monday to match up with the release day. Though the origins of why we ended up with Tuesday in US is not clear, some state it also had to do with physical distribution of LPs, cassettes and CDs. But with the a global market building and physical retail fading, there’s been clamor for standardizing the day, so that consumers in the UK don’t get a huge global release from an important band a day before consumers in the US or Japan. After polling the industry and doing market research, this week the IFPI, the global recorded music trade organization, recently suggested Friday is the top contender to become the global music release date. Once word got out all hell broke loose. US retail industry, who pushed for either the world changing to Tuesday or even perhaps Monday, strongly objected to Friday. Target actually suggested it would stop selling CDs if the date changed to Friday. Music release day matters quite a bit for the industry and Martin is right: the bigger the act, the more important a single release date will become. You can see with global tools like Twitter, Facebook and worldwide(ish) services like Spotify, it’s hard to have a consistent marketing message. After all “Hey, my new record dropped. Check it out Monday in London, Tuesday in New York, Wednesday in Tokyo and Friday in Berlin” won’t really fit in a Tweet. There’s also other elements to consider: distribution of products, promotional plans, radio appearances and a myriad of other now worldwide tasks that the industry must do to get music–and the word—out to the public. But that’s really not a music fan problem. It’s an industry problem. So why are we making it a fan problem? Look, I get it. A single global release day makes sense. And we should be doing everything possible to assist in supporting–if not expanding–retail channels. It’s still, for now anyways, the best way for the industry to make big revenues. A single release day would help. But it also seems like we’re just rearranging the deck chairs on the Titanic. Why are we focused on these old models? Meanwhile the new way fans listen, streaming music, is held captive by the old models. Based on the amount of customer feedback and market research I did while at a streaming service, it’s clear that a massive number of listeners don’t even know which day is ‘new release day.’ Sure those superfans who raced to Tower Records to pick up Viva Hate at 10 am on Tuesday, March 22, 1988, yeah, they know. Well, if your plan is to prime the publicity pump so you can get a number one record on the charts, sure. But what if your job is to make the music fan happy seven days a week? Not particularly. In terms of music services, we’re in this awkward stage of development. Sure, services have proven popular with music fans. Yet we haven’t fully transitioned into a different world. A perfect example of this is the industry’s attempt to determine how many streams equal a track or album sale. Billboard now says a thousand streams equal a track sale. How did Billboard settle on 1,000 plays? It’s not because of revenue generated by the services, because that info is unavailable and disputed. It’s not how many times a listener plays it before purchasing a track. A 1,000 plays seems like a random number that sounds like a lot. Why not 500 plays? Or 5,000? Or 50,000? While equating plays for a sale does serve those people who are supporting the old model, it’s utterly empty of any value to streaming companies. I wrote in depth about some of these issues in Junk Food Data. 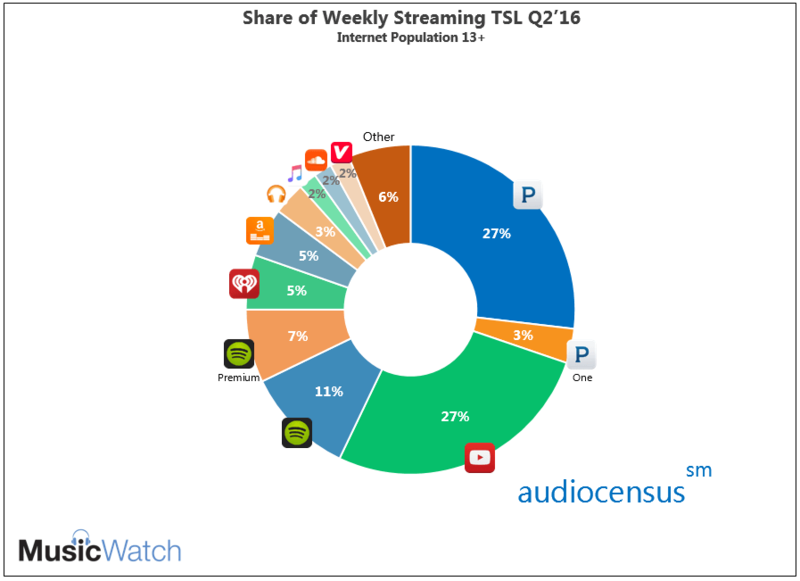 Streaming services are facing significant issues with customer acquisition and retention. Each company needs to be laser focused on what it takes to make customers happier to retain the paltry number who have signed up. Streaming must influence the industry and make it understand its success factors if we have a prayer at replacing the lost retail revenue with paid subscriptions. And if we continue to pay attention to the past? Then, I’ll take a deck chair with a nice view of that iceberg. Billboard Why Are Albums Released on Tuesday (For Now) in the U.S.?